Do You Ever Look Like THIS On Camera? When it comes to speaking on video, I’ll be the first to admit that it’s never come easily to me. And after shooting a LOT of videos .. I also have a TON of outtakes, so get ready to giggle! If you’ve ever struggled with speaking on camera, this post is for you. While it’s easy to beat ourselves up for not looking and sounding the way we want, it’s going to be a LOT more pro-active if you build on your presence and confidence with a step-by-step plan. I like to break this down into 3 main components: PREP, ASSESS, and BUILD. Let’s go through what these all mean. This is the first phase of just making sure everything is in order to SUPPORT you in making the best video possible. You can’t get down on yourself if you don’t have a plan in place for what you’ll say! I’ve always prepared for my blog videos by first drafting a script, reading the script out-loud a few times until I have the gist of it memorized, and giving myself permission to roll off-the-cuff once in a while. For me, having that game plan in place is what makes the difference so I can share clear, concise content. I find that it also helps to break down the script of my video into three main sections. You can find the full blog post about exactly that by clicking here. Sections prevent overwhelm and who doesn’t like bite-sized chunks, right? More recently, I’ve started to use a teleprompter. Yes, this takes a bit more work up front to write out those posts, exactly like how I would actually speak, but the time I save in recording them is INSANE. With a teleprompter, I can now easily pump out 4 videos within a couple hours .. where it would’ve taken me all day before. You can check out my favorite teleprompter app right here. Even with preparation, there will be days where speaking just does NOT want to come easily, and that’s okay! The best way to overcome self doubt is to be kind to yourself in your practice and positive self-critique. Which brings us to our next component: ASSESS. This is where you watch your videos back and make specific notes on things you want to improve on … while being KIND to yourself. Or instead of, “I never make any sense”, try something like, “I’ll make sure to pause after each idea to give myself a chance to slow down and re-gather my thoughts”. I’d recommend choosing just ONE THING to improve on, and working on that consistently until you see results. Choose one thing to work on and do it consistently.Don’t burden yourself with too many things off the top! You’ll get much better results when you get focused on ONE THING at a time, and slowly build on your camera confidence. You’ll actually be surprised at how much faster you’ll improve too! Then finally, you can move onto BUILD. This is when you begin to see improvements in your camera presence, and you can start to build onto the next improvement. For example, maybe you wanted to work on not speaking so fast on camera. Once you’ve been able to slow down your tempo, you can move into using more advanced methods like voice projection and body movements. For those of you with a tough inner critic, I’ve got another tip for you: from working with dozens of clients on their camera presence, I can tell you that MANY of those things that bother you (and can really chip away at your confidence) are not even noticeable to viewers on the other end. Know that self-criticism comes from our own perceptions, and often has little bearing on how the public views you. So be kind to yourself, okay? This was definitely good for a giggle, as I loved your cat darting around the room. I don’t do any videos currently, but if I ever start, it’ll be nice to keep in mind that even the pros fumble their words! Thank you Robyn! I’m glad you got a giggle 🙂 Making videos definitely takes practice, but it’s so worth it! I’d love to see what you come up with! Haha, love your cat! This makes me feel better about my videos–I’m always fumbling over words and have to record them a million times! Thanks Kirsty! Being on camera totally takes practice! Don’t give up .. keep pushing! I’d love to see your videos! You know I’ve never given this much thought until now but you’re right! This is such a visual world and people want to see it all! thanks for the helpful tips! Haha, fun to see someone else’s process that’s similar to mine. Yes, this is how it really goes, isn’t it? I liked how you strung them all together. Thanks for the chuckles. Thanks for being willing to share this, Emmy. 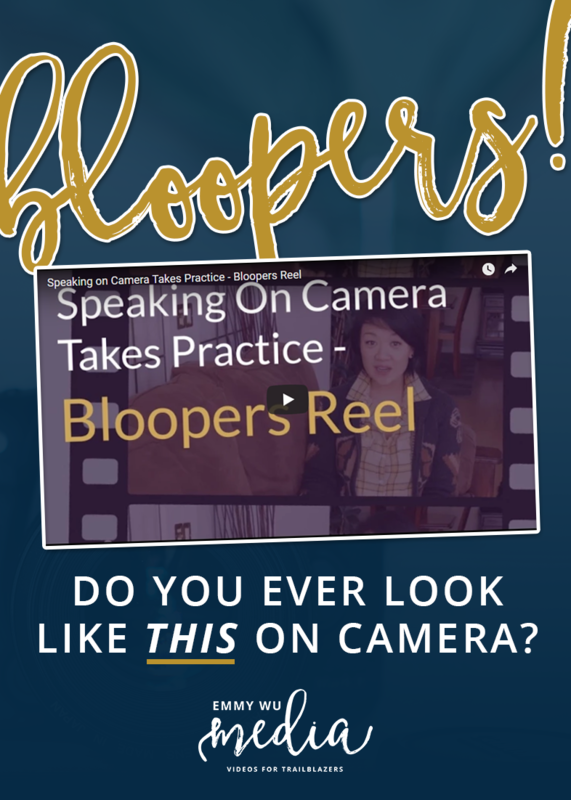 Your blooper reel is hilarious and very encouraging for me, especially this week. I did my first periscope broadcast on Monday, and even with notes I ummed and ahhhed throughout, and had to keep (silently) reminding myself that I’ll get better and more comfortable with practice, and this will happen if I keep my commitment to ‘scoping every Monday. Ironically my cat Bixby, who is also black, was in ‘psycho-kitten’ mode, racing through each room of the house and over every piece of furniture while I was watching this. Ben’s in very good company. Awww thank you Nikki! I’m glad that this was encouraging to share and you got a few giggles from it 😉 Sounds like you totally understand the kitty-craziness that always seems to happen during shoot! I’m glad I’m not the only one! Funny! I made a blooper video of myself and posted it on Facebook just to show, HEY… it’s okay to mess up. This video is so inspiring Emmy, we usually only see the end result and don’t know the work that is behing. We think ‘ how other people can do it so well?’ . But the real difference is to learn a few good tips from an expert like you and practice, practice, practice.Very good advice! I’m off to put these into practice!? Thank you for sharing this. ?